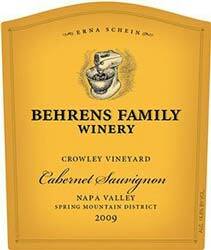 Behrens Family Winery is a boutique winery in the truest sense. Owned by Les Behrens and Lisa Drinkward, who have made wine under the Behrens & Hitchcock label since 1993, Behrens Family Winery produces small lots of six or seven wines a year at its winery perched high on top of Spring Mountain in Napa Valley. Each wine is a low tech labor of love: crushed into one-ton T-bins, punched down by hand, gently transferred to barrel, and bottled unfined and unfiltered. The couple also gravitates toward small, interesting and low-yielding vineyard sites, working with growers who they know, like and trust, and who are as obsessive about quality as they are.